SUNY Potsdam’s Crane Opera Ensemble will stage its Spring 2019 opera production, “Speed Dating Tonight!,” at 7:30 p.m. on Friday and Saturday, April 5 and 6 at Sara M. Snell Music Theater. “Speed Dating Tonight!” imagines a speed dating session at a bar in contemporary America. With traditional opening and closing musical numbers, the middle section of the opera is a group of one-to-two minute “dater arias,” which can be put together according to the number of singers available. The order, key and in many cases even the gender of the daters is flexible. The one-act opera, conceived by Dean Anthony and composed by Michael Ching, features a cast of 36 SUNY Potsdam students and guest performances by Dr. Margaret Chalker and Dr. Donald George, both professors at The Crane School of Music. Kirk Severtson, the musical director and pianist for “Speed Dating Tonight!,” is a vocal coach and chair of The Crane School of Music’s Department of Music Theory, History & Composition. 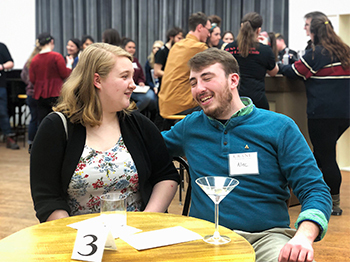 Tickets for the Crane Opera Ensemble production of “Speed Dating Tonight!” are $10 for the general public and $8 for SUNY Potsdam faculty, staff and students. To purchase tickets, contact the Community Performance Series Box Office, located in the lobby of SUNY Potsdam's Performing Arts Center, by calling (315) 267-2277 or visiting, www.CPSPotsdam.org. Dean Anthony draws inspiration and expertise from a com­prehensive career spanning over 30 years and innumerable turns as performer, director, educator, and producer. Frequently engaged as a stage director, Anthony’s artistic process is hallmarked by an energetic, gritty, and physical style. A major producer and promoter of new works, Anthony has helped facilitate the development of numerous projects including the world premiere of Tom Cipullo’s “Mayo,” which was staged at SUNY Potsdam last fall. His portfolio stretches across the repertoire from “Le Nozze di Figaro” to “Dead Man Walking” and includes regular engagements at regional theatre houses across the United States. Most recently, he was appointed artistic and producing director of Asheville Lyric Opera. Anthony’s upcoming 2019-2020 season includes productions of: “Glory Denied” with Asheville Lyric Opera and Union Avenue Opera, “As One” with Pensacola Opera, “Les Contes d’Hoffmann” with Opera Delaware, “Cavalleria Rusticana” with Knoxville Opera, “Carmen” with Opera Tampa, “The Merry Widow” with Asheville Lyric Opera, “Barber of Seville” with Opera on the James, and “La Bohème” with Peabody Opera Theater. Anthony is currently the Director of Opera with the Janiec Opera Company at the Brevard Music Center and has served on the Brevard faculty since 2008. Kirk Severtson has served on the music staff for nu­merous recent productions at the Dallas Opera, the Lyric Opera of Kansas City, the Atlanta Opera, and Opera Saratoga, including three notable world premieres in Dallas of works by Jake Heggie, Mark Adamo, and Joby Talbot. He has con­ducted at the Hawaii Performing Arts Festival and coached at Opera Viva (Vero­na, Italy), the Institute for Young Dramatic Voices, Opera North (NH), the Opera Theater of Lucca (Italy), the Cincinnati Opera outreach program, the Rising Star Singers Festival, Dorian Opera Theater, and as a Vocal Chamber Music Fellow at the Aspen Music Festival. He is a graduate of Luther College and holds graduate degrees in piano performance from the University of Cincinnati, College-Conser­vatory of Music. The award-winning Crane Opera Ensemble is a significant source for opera and music theatre in the North Country region of New York State. The ensemble provides exciting opportunities for students to experience all facets of opera performance and production, through rehearsals, coaching and classes related to performance practices and production techniques. The ensemble’s productions have garnered awards from the National Opera Association (2015, 2010, 2009, 2008, 2003), The American Prize (2011, 2017), and the Kennedy Center American College Theatre Festival (2010). To learn more, visit https://www.potsdam.edu/academics/Crane/opera.